Best-in-Class organizations execute on a strategy that supports the multi-channel nature of customer requests. These leading organizations do no just open up their service infrastructures to accomodate new channels, but also empower their teams to deliver an effective and consistent experience regardless of the channel selected by the customer. 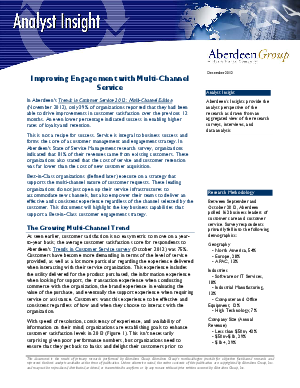 This document will highlight the key business capabilities that support a Best-in-Class customer engagement strategy.